Being an avid hiker and foodie, I've grown very fond of visiting Bataan. This province offers several hiking trails (check my post here) passing verdant forests and nicely decorated cafes and restaurants where you can enjoy a proper cup of coffee and affordable comfort food. It is also highly accessible from Manila via land travel, making it a good option for a short but rewarding out of town adventure. Here's a list of restaurants in Bataan where you can enjoy satisfying meals. The restaurant's name which means little angels (male) was inspired by the owner's 3 young boys, Miguel (after St. Michael), Rafael and Gabriel.This 2 year old family owned restaurant has a homey ambiance and serves any type of food that the family enjoys. Dishes are flavorful and priced affordably -100 Pesos above for the main dishes and 20 Pesos above for the desserts. Specialty includes, pork binagoongan and creamy tofu (my fave!). The restroom which has a mini garden is also nice! Located in a side road close to the highway, this home turned restaurant and badminton center offers a memorable plate of beef tapa rice, marinated beef with rice, nicely enveloped in omelette. If you like it sweet and savory, you'll enjoy their version of this Pinoy favorite. Another must try is the buttermilk bread. Similar to French toast, the aptly sweet chunky slice of bread is great to be paired with brewed coffee. Price range : 20-75 Pesos. This restaurant located within the complex of a gas station serves Filipino dishes and its specialty, hot chocolate prepared with batirol, a wooden object used to whisk the hot pot of a melted cacao beans. It also has a souvenir shop where you can buy snacks to bring back to family and friends. Dishes start at 200 pesos above and local delicacies such as bibingka, suman at 80 Pesos above. Hot chocolate starts at 100 Pesos. The restaurant's layout reminds me of a very hip food park with its black walls and wooden tables (perfect for flatlays :P), ideal for young people who want to dine with their friends. Equally pleasing is its food - a fusion of Western and Filipino favorites. Rice meals are at 79 Pesos above. I enjoyed their Sisig rice, nachos and the ribs, their bestseller. I normally don't eat ribs but my seatmate ordered one and it looked so nice, I had to try it. From Central Terminal in Balanga ride a jeepney bound to Orion, when you reach Orion, Shell Gas Station, walk at about 15 to 20 meters going to Orion National Highschool. Popular for serving Kapampangan and Filipino dishes. Their buffet is a must try for first timers. The spread features numerous dishes that are characteristically Kapampangan, satisfyingly full of flavor. 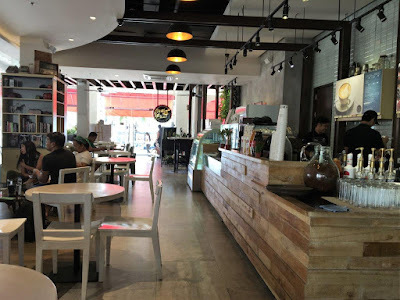 From the outside, it looks like your typical eatery by the road and I was surprised to discover that beyond its small doors is a wide dining area that can accommodate big groups with its long wooden tables. Its's also air conditioned and the ventilation is actually nice. Buffet is at 200 Pesos. Ala carte dishes are also available. As this place can get really packed during peak hours, contact them for reservation on the number below. Note : This is located on the same road going to Mt. Samat, before the long and winding road up the mountain. ESPADA GRILL- serves grilled tilapia, pork liempo, chicken bbq/inasal and other Filipino dishes. Try their Monday buffet, a bang for the buck at 195 PHP/head inclusive of meat, vegetables and seafood, dessert and drinks. Regular Meals start at 100 PHP. Bundles for those dining with a group are also available. MT. TARAK GUESTHOUSE & RESTAURANT - offers a wide selection of fusion meals and solo meals named after different types of adventurers like Hunter's 109 Meals, Backpacker Pork Schnitzel, Excurtionist Pollo Al Jerez, Hiker's Chicken Al Ajillo and more. Try their specialty, Pollo Iberico Antojo, slow-cooked roasted whole chicken that takes an hour to prepare. Price Range : Solo meals start at 109. They also serve dishes for sharing. Address : MAAP Road, Brgy. Alas-asin, Mariveles, Bataan. This pretty cafe prides itself in serving gelato that has "less fat, less sugar, but has more intense flavor than ordinary ice cream". Aside from gelato, they also serve rice meals, sandwiches and pastas. A local chain of cafes that serves tea, coffee and beautifully plated meals. It's Bataan's version of Starbucks but with cozier interiors! This is one of my favorite cafes in the country and I make it a point to visit a branch when I'm in Bataan. *There are two branches in Balanga. One is a few blocks across Crown Royale Hotel. 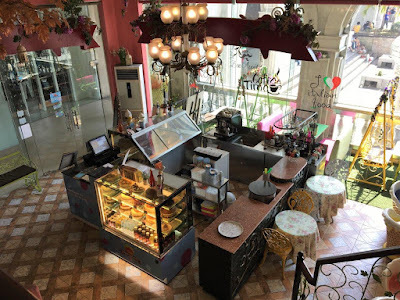 Located right next to one of the nicest hotels in Bataan, The Plaza, this cafe serves moist cakes and designer donuts. It is cozy yet formal enough to be a venue for small business meetings. It is a few steps away from Stregato Gelateria and just in front of Plaza Mayor de Balanga. Note : Business hours and location may change. Please double check with the restaurant before visiting. Check out this posts by fellow bloggers on other places to eat in Bataan. How to Get to Bataan? From Manila, take a bus to Balanga, the provincial capital or to Mariveles, the last municipality. From Balanga, there is a central terminal with trips to other municipalities in the province. The bus company, Bataan Transit has terminals in Avenida (Manila) and Cubao (Quezon City). For contact information and schedules, visit Bataan Transit’s website or their Facebook Page. Tickets can also be booked online through their partner website, Pinoy Travel. Another reputable bus company plying routes to Balanga and Mariveles is Genesis Transport which has terminals in Cubao and Pasay (closer to both international and domestic airports). For schedules, contact +63 2 709 0803 or visit their Genesis Transport Inc.’s Facebook Page. Travel time to Balanga takes 3 hours depending on traffic while Mariveles is roughly 90 minutes away from Balanga. I've also written about Bataan on Looloo, check article here. Should you need assistance in arranging your trip or getting additional information to any of the destinations mentioned above, get in touch with the provincial tourism of Bataan. Bataan Tourism Center (Balanga) - located along the Roman Highway, Bataan's major highway where public bus and vehicles pass by. It more than just an office, it's a destination itself, featuring a gallery, landscaped garden and a souvenir shop selling affordable products from Bataan such as bottled fish, shrimp paste, arrowroot cookies, mussel chips, cashew nuts and more! NOTE : This post was made in collaboration with the provincial tourism of Bataan. I've also been visiting the province a lot lately for personal trips and it has become one of my favorite places because of its accessibility from Manila and good food.